Find out if the Terrier i30 was usable, worked well, and can save significantly over a normal mechanical TRV in a real home. Automated Delight or Jevons' Revenge? Does what it says; noisier than expected when adjusting flow. i30 i-temp terrier bought on-line from e-on for £25.20 all-in on 2012/11/10, arrived 2012/11/15, took under 30 minutes to program and fit in our daughter's bedroom, even with some false starts! 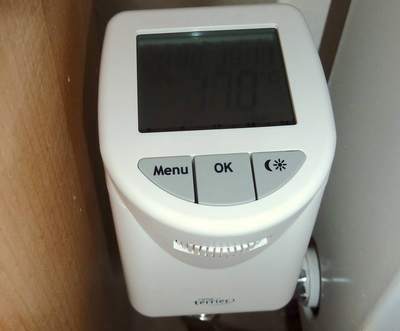 This programmable Thermostatic Radiator Valve (TRV), AKA "electronic TRV" ie eTRV AKA Programmable Radiator Control (PRC), has the primary feature that it isn't at a fixed temperature, but rather has a temperature profile against time, so in principle rather than having rooms heated whenever the rest of the house is, their heating can be trimmed within that time and with variable temperature. This PRC can wirelessly interact with a wireless window-opening sensor and a remote control, but I am not testing either of those, and it is operating fully stand-alone. In particular it has no way to 'call for heat' independently, so can only heat the room once the central heating is already running. The old regime, still in place in her brother's bedroom next door, is to leave the plain old mechanical TRV on frost (*) most of the time, but about 30 minutes before bed time turn the radiator up to '1' or '2' (for a target room temperature probably 16°C--19°C), and then at lights out around an hour later possibly turn it down to '1'. In the morning it is put back to '*' (and stays that way on holidays, etc). The alternative to this back-breaking 2-minute routine is to automate things, with a flashy new PRC for example, which can work with a regular routine. Jevons' Paradox (AKA the Rebound Effect) predicts that when we get more efficient at using a resource such as energy we may use more of it rather than less. In this case in addition to an evening 'on' I have done something that would have been impractical before without disturbing her, which is to have my daughter's room gently warmed in the morning before she gets up if the heating is on anyway. Therein may lie the paradox! 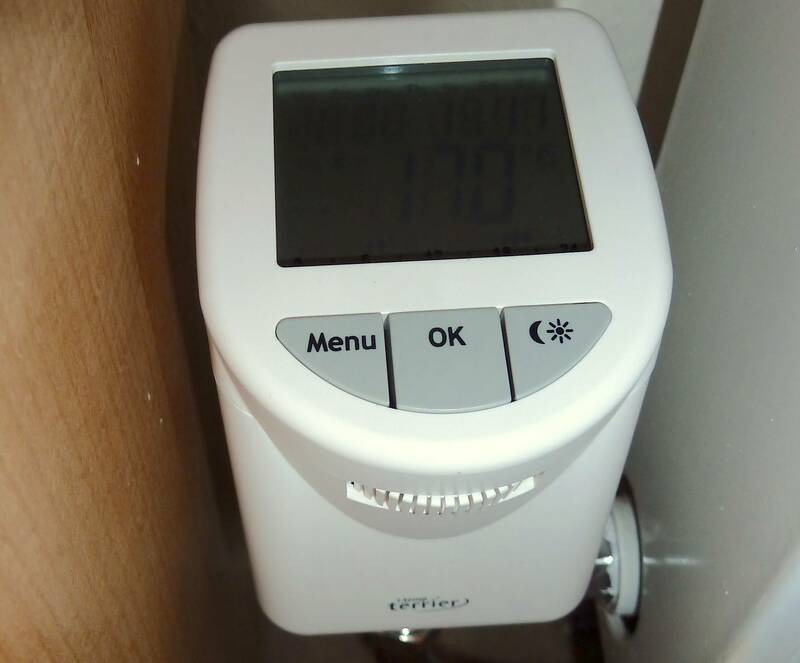 This also has nice features such as automatically lowering the target temperature if a window is opened causing a sudden temperature drop, and exercising the radiator value once a week to avoid it sticking. Note that the i30 is manufactured by ELV/eq-3.de. I put in a simple custom programme, and replaced the existing mechanical TRV head. The programming took a few attempts, though the PRC was quite good about allowing incremental corrections rather forcing me to start from scratch each time. It did help to have written down my program, especially when I had to cut it from 8 to 7 steps to fit! Taking off the existing TRV head was easy, but getting the i30 on without cross-threading its plastic fixing ring (aka collet nut) took several attempts including practising taking off and putting back one other mechanical TRV to see what was needed. The existing Bulldog brand TRV base needed no adaptor for the i30. 1 hour on in the morning at 19°C, cutting off sharply about half an hour before she goes to school ('optimal off') and preceded by half an hour at 16°C for a gentle wake up. 2 hours on in the evening at 19°C, preceded by an hour at 17°C to ensure the room is thoroughly warmed up if cold, and is not too chilly between supper and bed time. The rest of the time at 5°C. If those temperatures and times are about right, then I can tweak a more relaxed programme for weekends for example. 2012/11/16: there have been some initial concerns about actuator noise, timing and temperature levels (in the 'shoulder' warm-up time in the evening), and overriding for a friend's visit when the children will be playing in the room during the day. 2012/11/19: with temperature close to target I have heard bursts of 2--4s of acutator noise from the i30, so I suspect that that is indeed it attempting to modulate, and the 25s heard before is full-travel. And indeed a final burst of a little short of 10s that stopped flow entirely once room temperature was over target seems to confirm that notion. The friend visited today; I used the temporary override to put the temperature an hour before arrival to the 17°C 'night' (!) settings rather than the 5°C target otherwise in force. At the start of the shoulder period (with the same 17°C target) the i30 should have reverted to its automatic programme, and thus before bedtime should step up to 19°C as usual. 2012/12/11: we've used the override for another visit without difficulty, and the automatic return to the program(me) at the next set point is simple and sensible. I note that at the moment the device is not in 'locked' mode (at night). I note also that the room temperature overshoots by up to about 2°C, such as now being at just short of 21°C against a programmed target of 19°C. 2012/12/19: as a small experiment I'm lowering the rad flow temperature from ~60°C to something nearer the level that a heat-pump might produce at a decent CoP to see if the 'early start' shoulder time that I've programmed into the i30 ensures that the room has time to get to temperature and stay there with fairly mild external temperatures around 7°C over the next few days. Our Potterton Performa 24 claims to have a range of about 30°C--85°C for the flow temperature; I have initially set it to about 1/3 max (~45°C?) (though it had already been running a little while at the usual ~60°C). At 30°C, the very bottom, the burner was only coming on for a very short while, at least when I was looking, which is probably very inefficient. The advice in the manual is to set the flow temperature to maximum in winter! 2012/12/20: it looks as if with the reduced flow temperature (and ~9°C outside tonight) the radiator is capable of heating the room as required and to schedule, especially with the help of the leading warm shoulder period, and will overshoot the target temperature less, which might also be achieved by lowering the flow rate a little with the valve at the other end of the radiator with the previous higher flow temperature. Other rooms seem to still be heating at an acceptable rate, and, for example, the radiator beside me is at about blood heat, and as it is the only one still on an external wall, its lower temperature may slightly reduce peak heat loss through the wall. 2012/12/26: I think that the extra 'hiss' from a closing mechanical TRV is of comparable volume to the i30 valve whirring noise, and in any case that whirring does not seem to be disturbing our daughter. 2012/12/28: the rest of the family is away for a few days so I've put the i30 in holiday mode (at frost/5°C) until they come back to conserve a little. 2013/01/02: came out of holiday mode just fine; later I gave the room a sneaky manual boost (using the manual override facility in the i30 with a couple of button presses) along with the rest of the house when I knew that the family was a few minutes from getting back! 2013/01/13: even with the flow temperature at the lower level (~45°C) and outside temperatures around freezing, room temperatures seem to be more-or-less reaching target or close enough, though slowly and stuggling a bit in the two bedrooms with the not-yet-superinsulated exterior north wall (including the room with the i30). At such time as we slap 40mm of aerogel IWI on I suspect that we could use an even lower flow temperature and be well into heat-pump territory. The hour-long warm-up shoulder that I programmed into the i30 seems to be a significant help. 2013/01/17: with the flow temperature on the boiler set to max (80°C) the girl's bedroom warmed from 14.6°C to ~17°C in 30 minutes, so some combination of weather compensation and 'optimum on' early start might ensure that desired setpoints are reached. Eventually the device was replaced with various rounds of OpenTRV units. 2017/05/29: I received a message saying that a district heating company had just removed ~200 of the i30s from a research site, and that "they were removed because they're not very good products" from a usability perspective. It may be possible to redeploy these where there is a patient facilities manager (FM), eg caretaker or site manager, with good eyesight and agile thumbs. Schools might like to fit these on selected radiators in classrooms so that heat can go off at nights everywhere other than near the teachers’ desks for example. Some of them might be good for my local school to reduce heat demand in winter out of core hours (eg keep the teacher warm when still at their desk, but let the rest of the classroom cool off a bit). Suggestion that i30 is rebranded ELV - ETH comfort200. i-temp PRC claiming 30% saving over normal TRVs in a field trial. Chalmor eTRV and other products including occupancy-sensing thermostats. First published 2012-11-15 , updated 2019-04-18 , rebuilt 2019-04-19 . Site copyright © 2007-2019 Damon Hart-Davis. Hosted by ExNet.